A couple of days ago, I posted an article about how the quarantine xattr works, and outlined a method of setting it. This was based on work by klanomath, published on StackExchange, which in turn was based on research by reitermarkus and others on GitHub’s caskroom/homebrew-cask. I’m pleased (very pleased!) to report that I have got this method working in my little xattred tool, which is now available from this article as an alpha release. I’ll explain in code another time, but xattred now has two buttons: one to inspect all the extended attributes (xattrs) for a file or folder, the other to add a quarantine xattr to the selected file, which should force a full Gatekeeper check when that app is opened. Here it is, putting (a copy of) itself into quarantine. The xattred.app has just been built in Xcode, and when inspected in xattred, has no xattrs, as is usual. I then clicked the Add quarantine xattr button and selected xattred.app (not the running copy, of course). The contents of the xattr added are then shown to the right of the button. I then clicked on the Inspect button and selected xattred.app again, so that the xattr is displayed as it was written. The first item, 0083, should force a full Gatekeeper check. The second is the (real) Unix system time of the ‘download’. 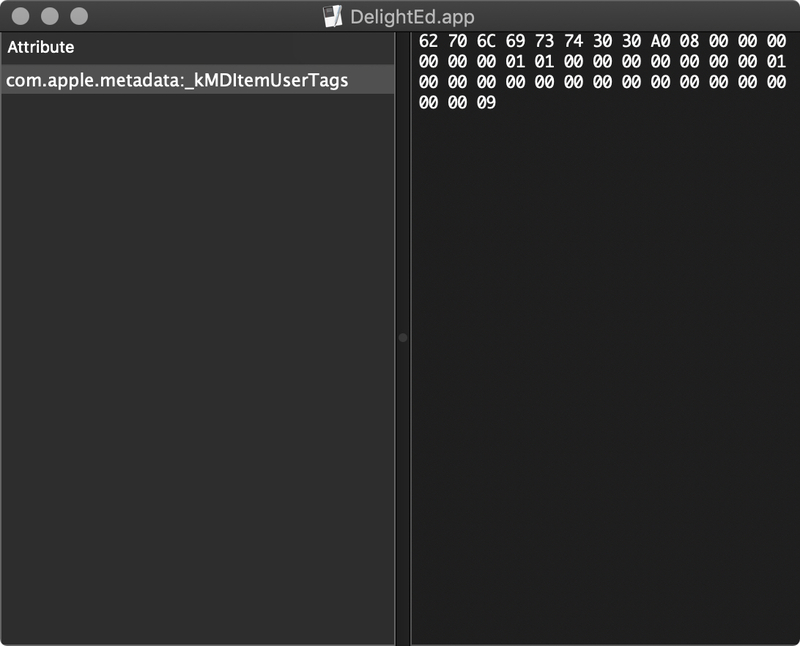 The third identifies xattred.app as the downloading app, and is followed by a real UUID for that event. Not only does xattred write these into the quarantine xattr, but it also enters them into the SQLite database at ~/Library/Preferences/com.apple.LaunchServices.QuarantineEventsV2. I’m unsure as to how necessary that step is, but as we’ve come this far, it’s worth doing the whole job properly. When you now try to open that app, it should undergo the full Gatekeeper check as if it had been downloaded from a website, and display one of the standard range of dialogs – in this case confirming that it passes. Note that the website associated with the download is example.com and thus a dummy. So long as you don’t click on the Show Web Page button, you should be OK! When Gatekeeper’s full check has been completed successfully, and the app opened, quit it and you can then inspect its quarantine xattr again. with the bits in its Gatekeeper score reading 00e3, indicating that it has passed and has been run. xattred thus spares you from having to check that your app passes a full Gatekeeper assessment by uploading and downloading it. The latest release is available in Downloads above. Posted in Macs, Technology and tagged extended attributes, Gatekeeper, macOS, quarantine, security, Sierra, xattr, Xcode. Bookmark the permalink. Is this a review of your app: http://rixstep.com/4/2/20181225,00.shtml ? It appears to be a polemic about it. As someone who has reviewed software for many publications including MacUser (since about 1989) and now MacFormat, I don’t recognise that as a review in any sense of the word. Not only that, they didn’t have the decency to inform me of that tirade. But if you don’t like or want xattred, you don’t have to use it. I happen to use it most days. It’s not perfect, but most of that torrent of abuse is actually not about the app but about Swift, Xcode, and the way they build apps, not the code that I have written. But of course they lack the critical capacity to understand that. Sadly, there are a lot of shits around. I would like to respond to one specific allegation: when I first made xattred available here (which is far from recently – Rixstep claims 2018, but in fact the first release here was over a year ago, I think in August 2017) I believed it to be the first GUI xattr editor following repeated web searches to locate a product which I could use. I’m not daft – I don’t waste many weeks of effort re-inventing the wheel when there’s already a good product out there. There wasn’t then, and as far as I can see, there still isn’t any other app now. I have attempted to download Rixstep’s demo, which doesn’t seem to include the app which they claim is a GUI xattr editor. Neither can I see any screenshots on their website which show such an app. Yes, they may have a non-GUI xattr editor, but for all their polemic, Rixstep’s own promotional screenshots show a surprisingly crude interface. As Rixstep’s current demo version of its software tools is dated 2017 and not one of its apps is graced with a signature, I’m afraid that I declined the opportunity to evaluate them further. Nowhere in the ‘review’ do they mention that xattred is not only properly signed, but has been notarized for some time now, for improved security. There is another important point here: no software developer should ever try to review a ‘rival’ product, even non-commercial. You have too many axes to grind, and in this case try to throw at the developer of the other product. I would not dream of writing a review here of their xattr editor, much as I am now sorely tempted, because inevitably all I would do is try to rubbish it in every way possible. That’s not helpful to anyone. I wish John at Rixstep a very happy Christmas. I think he is in need of it. Humbug! Afaik it’s actually Rick Downes at Rixstep, and that’s just how Rick rolls. 😉 Some of us love him for it, others hate his guts—mostly those at the receiving end of his often scathing & bellicose critiques. But think what you want about the style, he has substance & knows his stuff, Objective-C, the command line, the ins and outs of macOS, down to the deepest levels of the filesystem, networking, and the history of the whole platform as well. And he is an ardent critic of Apple’s recent changes to macOS, the system programming etc., and I wish Apple would listen at times. He tells it like he sees it, and it’s more often than not exactly how it is. Be that as it may, his Xattr app (and all the other ACP apps) have been around for a long time, sometimes there are new releases like Rixtag and Tracker, but the rest are regularly updated (but mostly not in terms of functionality), and the current Xattr version is Mojave- and Dark-Mode-compatible. But don’t be aggrieved. A lot of us love & use your software, and we really appreciate your work and your articles! If that’s as far as his interface has evolved over 14 years, I feel vindicated in making my claim. If that were my app – and a commercial product too, not freeware – then I don’t think that I’d be stupid enough to go pouring torrents of abuse at others. People in glass houses shouldn’t throw stones.